Four villas built successively on the edge of the flood plains of the Rijn respond to their surroundings each in their own way. The plan of the first, Villa Deys (1E, 2002), constructs three linear zones around a central swimming pool. The south facade consists entirely of glass and has mechanically operated panels of wooden slats that double as solar protection when raised. The other three villas have two storeys with the living room upstairs overlooking the river. In Villa HJ (1C, 2002) and Villa Room (1B, 2004) the plan unfolds in a spiral about a central patio. 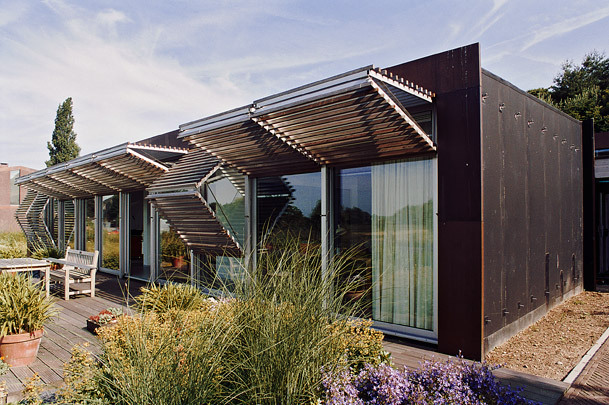 Villa Truyens (1D, 2005) consists of two blocks stacked at right angles with semi-transparent screens of wooden slats for privacy. Sustainability techniques and the relationship with nature are an integral feature of all four villas.